All School and College & Institute who is affiliated to Bihar School Examination Board have to update the OFSS. Bihar Board is working on the Online Facilitation System for Students through this application students from the Bihar State or rest of state and BSEB or Any other Board students after the passed in Class 10th (Matriculation) with to take Online Admission in 11th Science/Arts/commerce they can able to apply online. 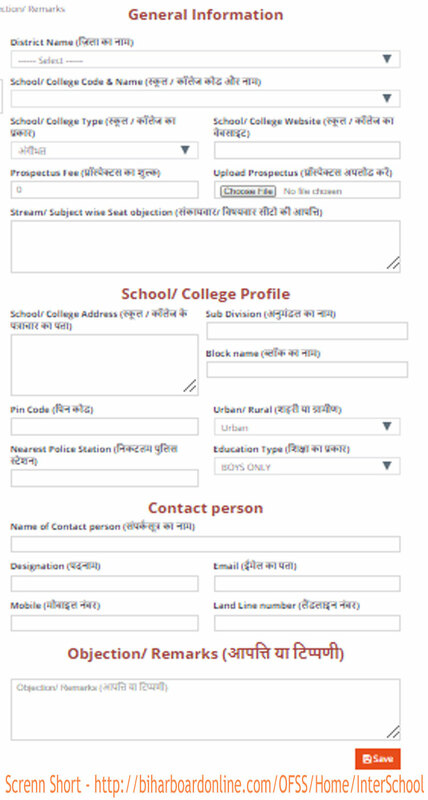 Easy to find every detail of Respective students BSEB now going to make online Admission Portal, Through the OFSS students will be able to find college/School in their District/Block. We will update all details for it this is all about Bihar Board 10+2 School/College Update Institute Profile for Admission in Class 11th students. Every School, College and Institute who is affiliated with Bihar Board and providing Class Intermediate education, they all have to provide the details which BSEB has been asked through the Notification Number 68/2018. It is expected that what have to update and how to update We have mentioned every detail for it. Please note that this information will be updated by School/College Principal or Administration Person only. There have to 4 categories which BSEB Affiliated School College Institute have to update. Before going to next how to open this form of BSEB Online Facilitation System for Students (OFSS) Software. This is the online software which can be filled without of login which has been provided on Bihar School Examination Board. Below is stepwise described the details. On the Home page Menu Bar link is given for Other links (click on that). Time to Time Board will be contacted to the given contact details to Appointed Person for this work. If concern College/Institute/School have Principal has any complaint or Suggestion then they can proceed with it. This form should be filled last by 30th April 2018. Please Note any School/College wish to make their respective Institute/School/College Website under 3000/- for 05 page with contact details and much more like image gallery contact us @ cuteheart049@gmail.com. koi student 11 the admission me arts me apply or Diya h ab wo commerce Lena chah rha h.kya aisa possible h.
Nahi… Board ne correction ke liye samay diya tha.